Indian weddings are known to be a grand affair with multiple ceremonies and celebrations lasting days. The guest lists go into the hundreds and even thousands. Every detail of each function is intricately planned by the bride, groom and their parents to ensure that their family and friends have a great time. A wedding day is one of the most important days of your life. it’s also a day where stress can play havoc if you’re not prepared. Since the big fat Indian wedding is not an easy event to survive unscathed, so let’s get planning for it. Are you a Complete Bride with all Bridal Accessories ?? Once after choosing your wedding outfit, the most important thing that should be on your list is Bridal accessories. 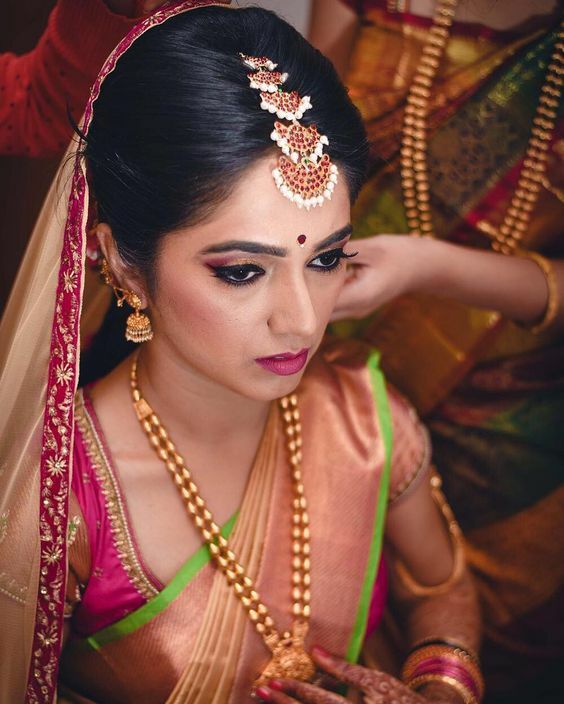 Every bride wants to look her best on her wedding day and you can’t achieve this without the best Indian wedding accessories to complement your outfit. After all, a wedding is the special event where you can accessorize as much as you want. Also, How much ever you accessorize the bride, that much she shines on her Big Day. don’t you? There are so many things to buy and arrange for your wedding. It’s obvious to overlook few of those wedding accessories. However, it’s the small details that make your wedding unique and special, so run through some important adornments that should present in your checklist to make sure you’ve got all the Bridal accessories you need. Maang Tikka is a precious Hair jewellery item which is cheerfully adopted by a woman and it fetches her centre of attraction due to its elegant appearance and lavishing lustre. The maang tikka is worn at the centre parting of the hair with a classy pendant falling over the forehead. 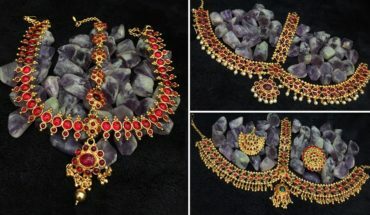 A good looking gemstone can be accompanied with gold maang tikka which complements the overall appearance of a bride. Brides were accessorizing their head with Heavy Matha Patti earlier days with Surya and Chandra billas on either side of Hair Partitions. This Matha Patti gives Grandeur look to the bride. Since the brides whoever wants to be simple but elegant can stick to heavy Maang Tikka instead of Matha Patti. 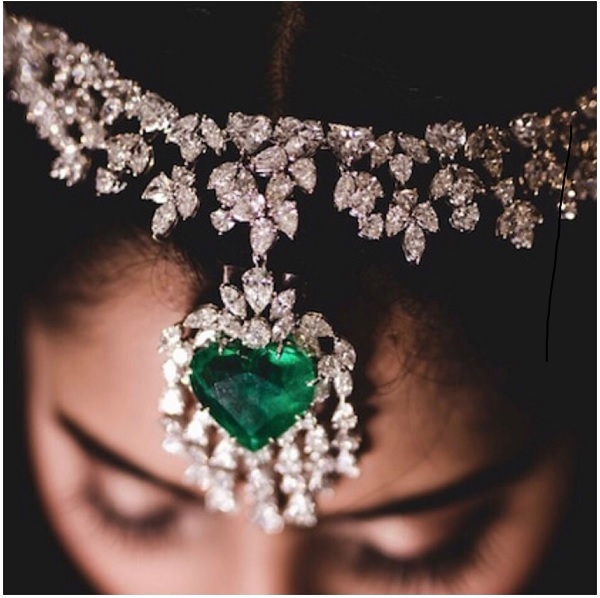 There is a chance that you may forget this elegant jewellery during your wedding due to hurry in that wedding events and wishing wedding guests who wanted to visit the bride before the wedding. What to do If you don’t have Matha Patti? Don’t be panic, in case if you forget the Maang Tikka. Try to accessorize your head with Any necklace with pendant hanging and secure the necklace ends with pins. You can even try Pearl String as Matha Patti. Gemstone Pendant certainly works great with this Fix. I promise you to seem like a princess with this trick. This has got to be one of the most overlooked accessories for the wedding day. A nose ring is worn through the left nostril by Hindu women on the wedding. Not only on the wedding but also on other auspicious occasions makes the Woman’s face more prettier. It is perhaps one of the most ethnic Indian ornaments, worn through a piercing in the nostril. It is generally made out of gold and silver, as big as a bangle or as small as a nose pin, with precious stones studded. The Nath generally having a chain on one side connecting it to the hair behind the ear. Mostly these Bangle size Hoop Naths are must wear nose ring for North Indian bride. The spot for the nose pierce is linked to the reproductive organs of a woman. For that reason, women get piercing done before their wedding itself. In case if your nose piercing is not yet done and you are unenthusiastic towards Nose Piercing then, Pressing nose rings are the best option. 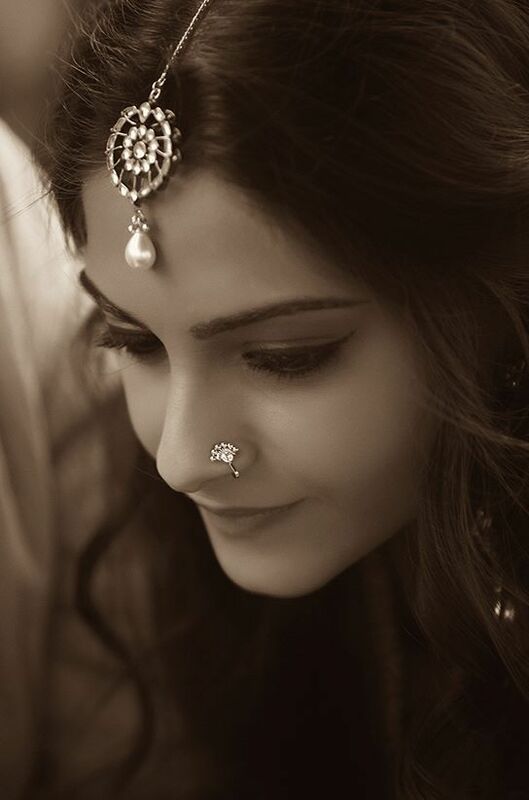 Don’t miss out this nose-rings since it gives a complete bridal look. What to do If you don’t have Nose Ring? If you forget about this nose pin, you can easily resemble the nose ring with Stone studded bindi tikka. The stone as a nose ring that sparkles like a diamond stud with photography lights. Anklets are chains that are worn around the ankles, most often attached with a bunch of chiming beads. It may be a slender chain or it may be thick multi-layered design. It is generally made of silver as wearing on your feet is considered to be auspicious. Since Gold ankles should be worn by only Royal Ladies on their feet, Silver or Kundan fancy anklets are preferred by most of the brides. Most importantly, No One will allow the Hindu Bride without anklets at their feet since it got it own significance in every tradition. Don’t compromise with these heavy anklets during your wedding because anklet makes their mark when your toe rings are adored at the wedding and consequently enhances your feet’s beauty. What to do If you don’t have Anklets? You can simulate any fancy or oxidized necklaces pairs or studded chains since they seem like real anklets. Matilu known as Maattal in some places in south India are chain shaped jewel used to hook in the hair from the earring stud. These matilu are worn from the front of the ear which supports your heavy Bridal Jhumkas or earrings. These Matilu are most often made up of Gold & diamonds. Likewise, Champaswaralu also Chains those will be attached from ear stud or hair from the back of the ear. These Champaswaralu are multi-string chains available with or without hangings. The pearl or Gemstone like ruby or emerald studded hangings are trendy now a days. These ear accessories gives feminine look any bride. Never miss out these Ear accessories because they enhances your beauty during side photo-shots. 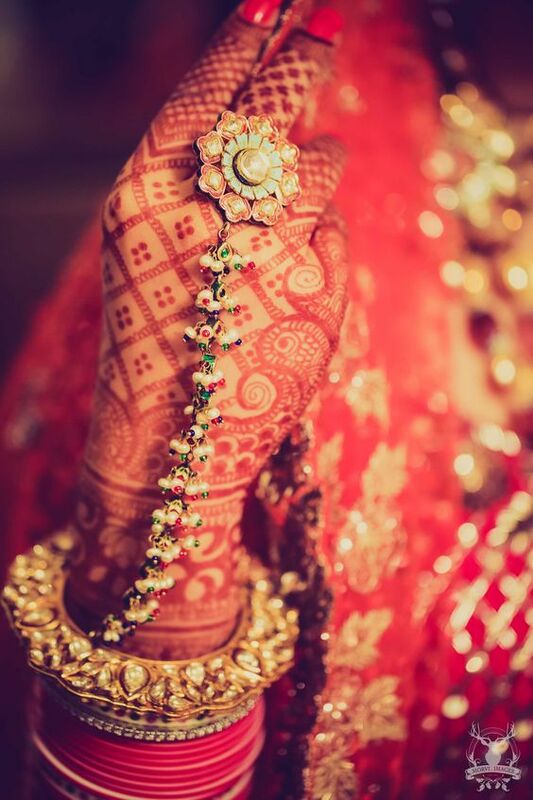 These are a type of jewelry meant to be worn by the bride in her hands. Four or five rings are worn on the fingers from which chains emerge attaching them with a central motif which further is connected to a bracelet by another chain. These are most often made of gold and studded with Kundan work or precious stones. These Haathphool are available in simple designs as well , they are simplified further with a single ring instead of five rings attached from a bracelet. HaathPhool also available with a studded chain with ruby or emerald or Polka dots to grab even more attraction. Also, two finger attached rings became popular for Sangeeth or Reception events. 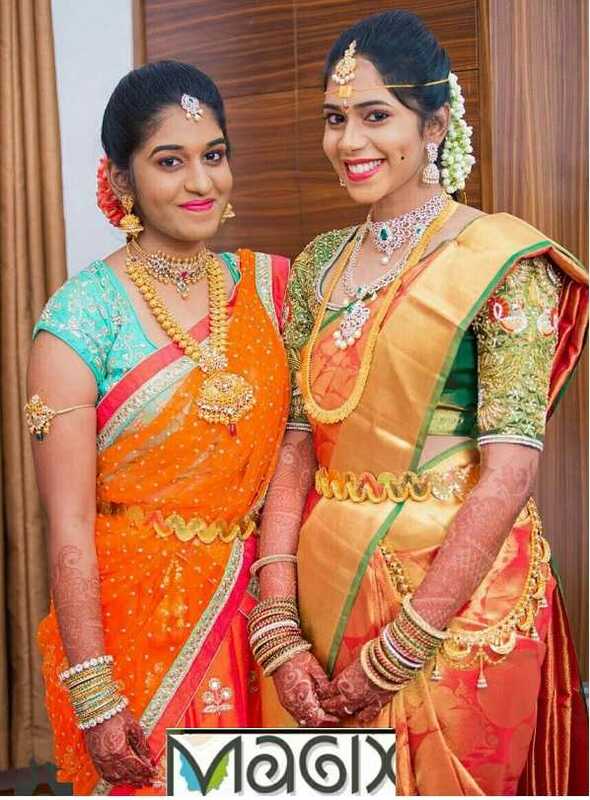 These haathphool hand accessory looks great when you hold coconut or ‘Thalambralu’, Because those are very the significant traditional events in most of South Indian weddings. This is generally a simple or elaborate ornament meant for the bride to wear on side of her waist. This emphasizes the femininity of her waist and improves her overall figure. These are different from Waist Belts or oddiyanam because waist belts are wore around the waist where as these Hip chains are wore just one side of the Hip. These Belly Hip chains are just like multi layered chains with hooks attached on both sides. These side chains can be paired with Waist-belts or you can wear the hip chains alone to get a resplendent bridal look . What to do If you don’t have Side Hip Chains? In case if you overlooked these Hip chains, try any pearl strings or step chains or plain or pendent necklace can be wore as hip chains by securing the both ends with safety pins. Pair these string chains with Waist belt rather single to get the complete look. Most of the south Indian brides go for Floral or Gold Poola-Jada for the wedding with some pretty studded Jooda pins. What about pre-wedding and post wedding ceremony hair styles?? which ever hairstyle you go for Pre-wedding or Post-wedding ceremonies, these Hair accessories are so important besides the flowers. A pretty embellished pin adds some charm to a bun or hairstyle. 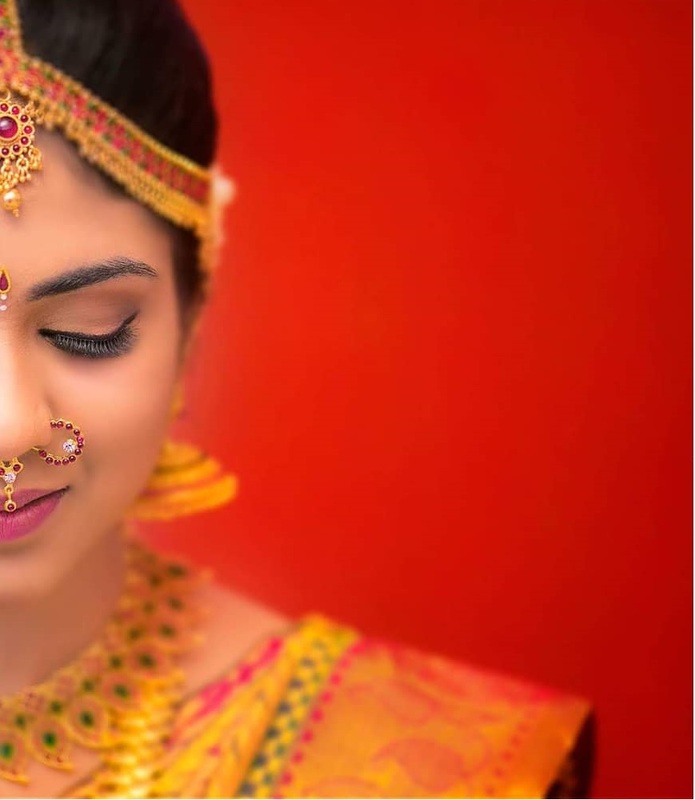 Jooda pin for the bridal bun, Jada Chains for Open Hair styles, Fancy Hair clips for the braid for South Indian brides must have hair accessories. These are some of the Bridal accessories you may overlook in your wedding but they add their significant mark for you as a bride. Hence, Make a list of all your bridal accessories and check them while shopping and just before you leave for your D-Day. So that you can sparkle in your wedding with all bridal Accessories. Other than this there are many more bridal accessories which are used by modern brides. Watch the below video to know more about the trending bridal jewellery which is preferred by today’s bride.